You’ll find the main entrance to Raffles Europejski Warsaw off the main road of the Royal Route (Krakowskie Przedmieście). It’s the road that leads to the old town; which is the same place where you’ll find the royal castle. 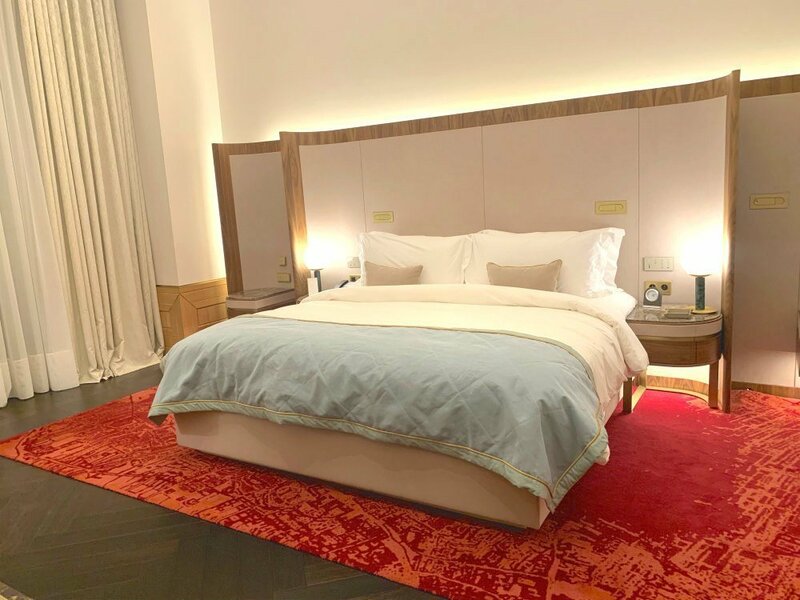 The 5-star hotel’s pretty new (opened in 2018), although the building itself has been around for over 160 years. Italian-Polish architect, Enrico Marconi, designed the building in a neo-renaissance style in 1857. It would later become the meeting place for writers, poets and artists. There’s an inviting feeling the moment you step inside the lobby. Some luxury hotels can have an air of pretension about them, but it’s non-existent here. We arrive on a quiet weekday during the start of winter, and the warm ambience is a welcome sight. A décor that mixes modern features with old-school charm, it embraces the style associated with the Raffles brand. For anyone unfamiliar with the Raffles brand, it’s a chain of luxury hotels and resorts. The original Raffles hotel opened in 1887 in Singapore, and since then, the group has expanded internationally. At present, there are 13 Raffles luxury hotels around the world. To say the hotel’s in a good location is an understatement. As mentioned above, it’s on the same road leading to the old town of Warsaw, which is one of the main attractions of Warsaw. It also happens to be the location of the Christmas market that starts each year around the end of November. 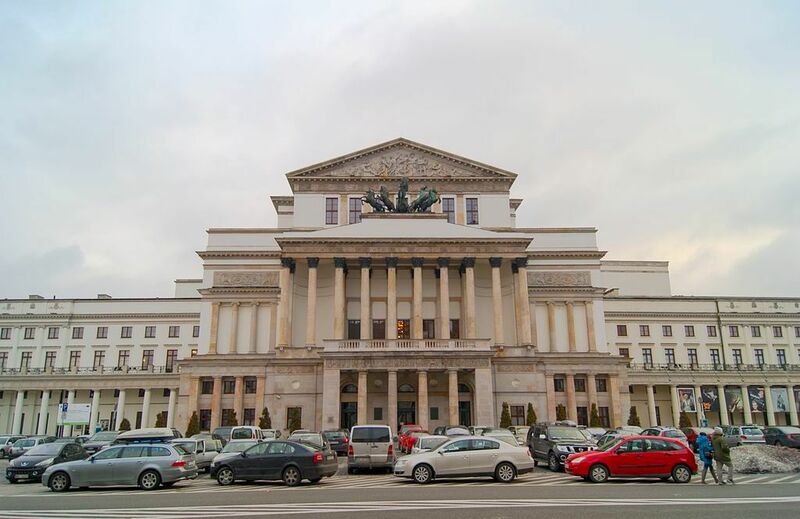 The Polish National Opera House is minutes away from Raffles Europejski Warsaw, as are several good restaurants and bars. In short, staying at this luxury hotel means you’re in walking distance of some of the city’s top attractions. It’s only by walking around Raffles Europejski Warsaw that you realise just how new the interiors are. Pristine hallways that never seem to end, and that faint alluring smell of newness all around. Hotel accommodation with an understated sense of style linger behind every door. There are 106 rooms and suites to choose from. They include the deluxe room, Raffles room, junior suite, grand suite, or the seriously impressive signature suite. Each room and suite comes with its own library — a feature inspired by the building’s artistic past. Also keep an eye out for the modern Polish contemporary art, where no 2 pieces are the same. The bright and generously sized marble bathroom and shower is a standalone selling point. Its specially commissioned décor includes a marble collage of the Warsaw skyline adorning the bathroom walls. Toiletries created especially for Raffles Europejski Warsaw by French perfumery, Blaise Mautin, line the bathroom shelves. To give you an idea of the room sizes, the deluxe and Raffles rooms measure 484 sq ft. The junior suite is 753 sq ft, the grand suite, 914 sq ft and the signature suite 807 sq ft. They all include a king bed, marble bathroom and shower and 24-hour Raffles butler service. Other additions include complimentary WiFi, and unlimited access to the Raffles Spa, gym, sauna and steam room. Opening the door to the grand suite is like entering a larger — and chicer — version of my living room. Soft lighting illuminates its features, from the 2 plush sofas to the striking writing desk. On the way to the bedroom is one of the largest hotel bathrooms I’ve ever seen. A standalone bathtub is the focal point of the room, with an equally spacious shower room. It’s what you’d expect from a luxury hotel bathroom, and nothing is amiss. The first thing you want to do when entering the bedroom is jump straight onto the king bed. This is a bed built for the cold weather, and you’ll never want to get out! It’s larger than it looks in my photos and very enticing. The headboard not only stretches the width of the bed, it also curves around some of the mattress too. In short, it’s unlike any headboard I’ve come across in a luxury hotel. 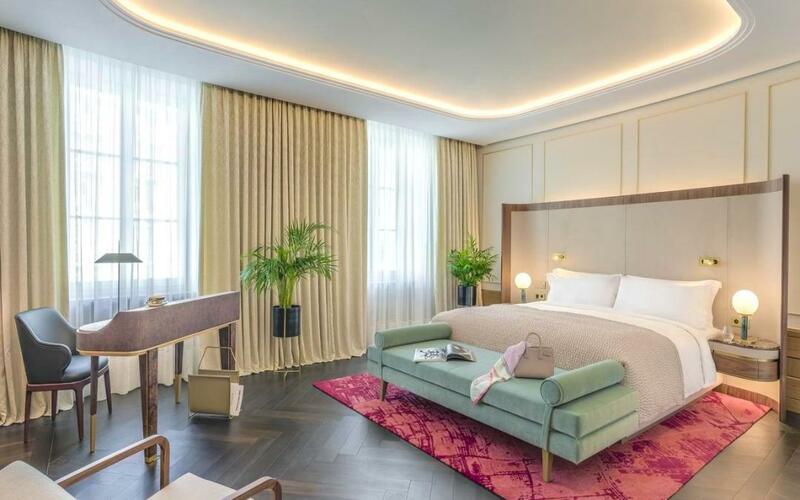 Custom-made linens and down bedding complete the Raffles Europejski Warsaw grand suite sleeping experience. The room itself is pretty minimal. Aside from some artwork on the walls, and the art deco style bedside lamps, it’s designed for optimal rest. One characteristic of the suite I wasn’t expecting to find was the larger-than-life terrace. We didn’t venture out for too long given the freezing Warsaw temperatures, but I can imagine it’s ideal come summertime. Staying in a suite as fabulous as this one is bound to come with extra perks. There’s a complimentary limousine pick-up service from Warsaw Chopin Airport, ensuring you arrive in style, and stress free. The hotel can also arrange art and history tours if you wish, or you can speak to the art concierge for their recommendations. There’s a rush of excitement I feel every time I step foot into a new spa. Add luxury to the equation and I’m on cloud nine. I can only describe the Raffles Spa in Warsaw in one word, and that’s exceptional. So much thought has gone into the design to create a space that’s welcoming, warm and overwhelmingly relaxing. Following my therapist through the spa, every room and feature becomes even more impressive with every step I take. 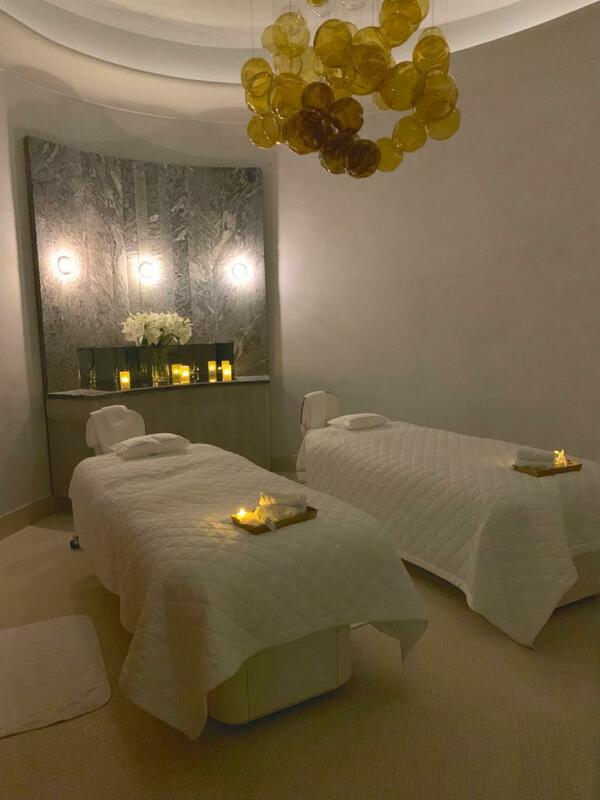 There are 6 generous size treatment rooms, with soft dim lighting and calming music gently playing in the background. For couples, there’s an amazing VIP suite where you can share the experience with your partner, relative or friend. 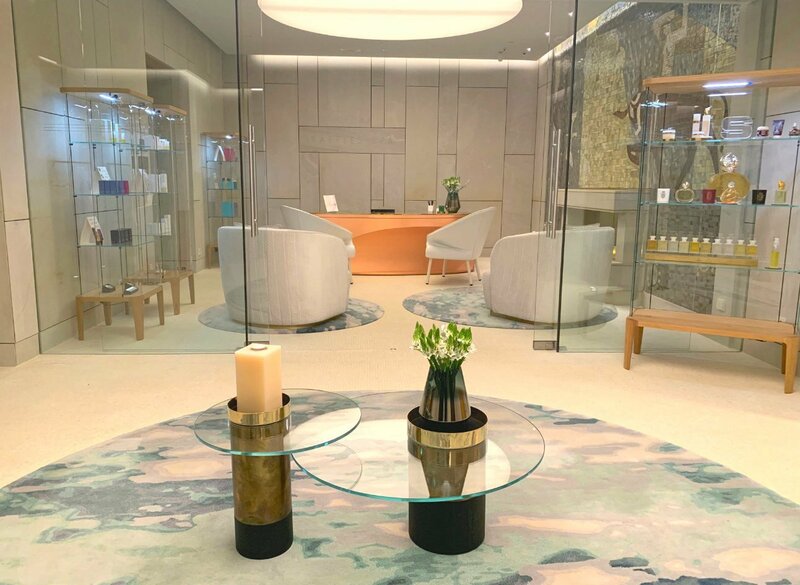 They use premium Sisley Paris and Aromatherapy Associates products, designed to massage away stresses and address any skin concerns. 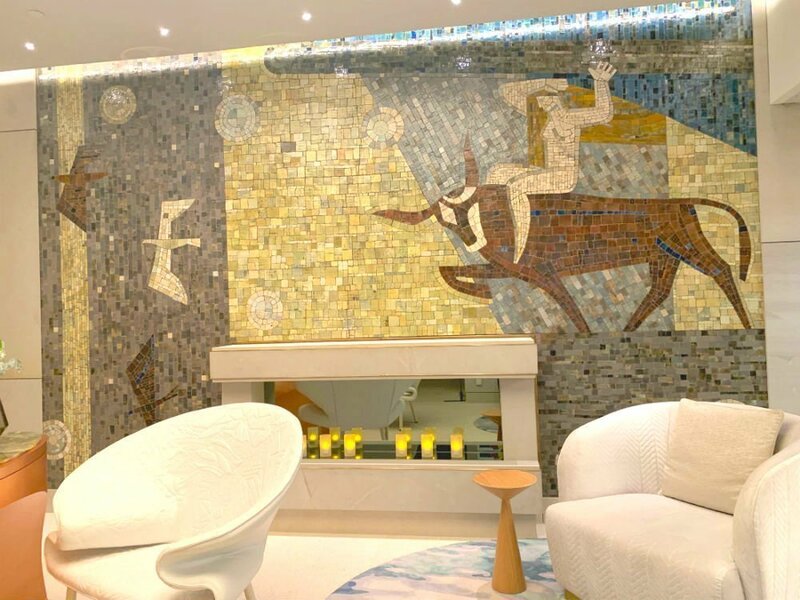 Before leaving the spa, take note of the striking mosaic piece in the lobby. It’s the original mosaic from 1961 that was a part of a previous reception. It’s titled ‘Abduction of Europa’ and was created by Polish artist Krystyna Kozłowska. There’s an eatery to cater to every food group at Raffles Warsaw. For an elegant dining experience of Polish and international fusion flavours, book a table at Europejski Grill. The restaurant’s interior of white and blue reflect the colours traditionally used on Polish pottery. It’s the place in Warsaw to try Polish fine dining, with a memorable view to match. 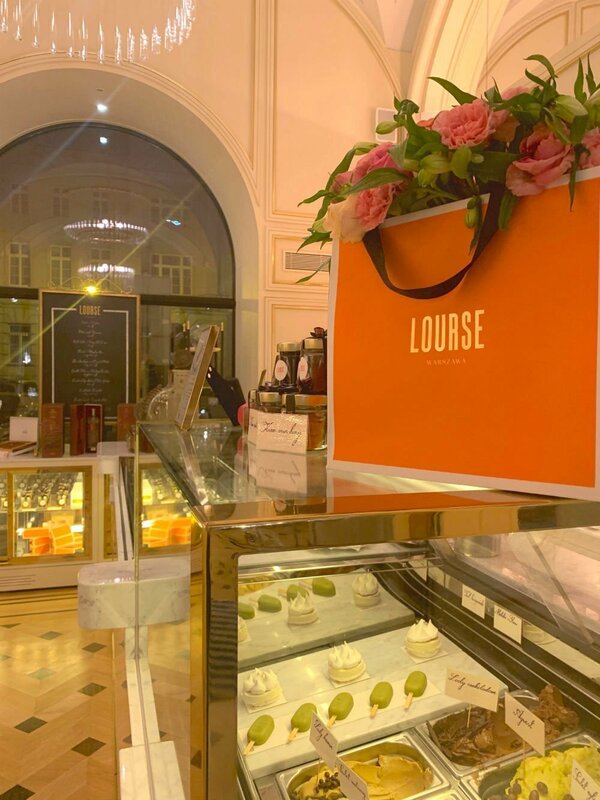 Those with a sweet tooth need to make space for a visit to Lourse Warszawa. This patisserie on the ground floor is a century-old Polish institution, and has been revived for the 21st century. It used to be the place where locals would come together for cake and tea, and is quickly becoming a Warsaw favourite. The patisserie still has some of the original features from the past, including the magnificent brass till. 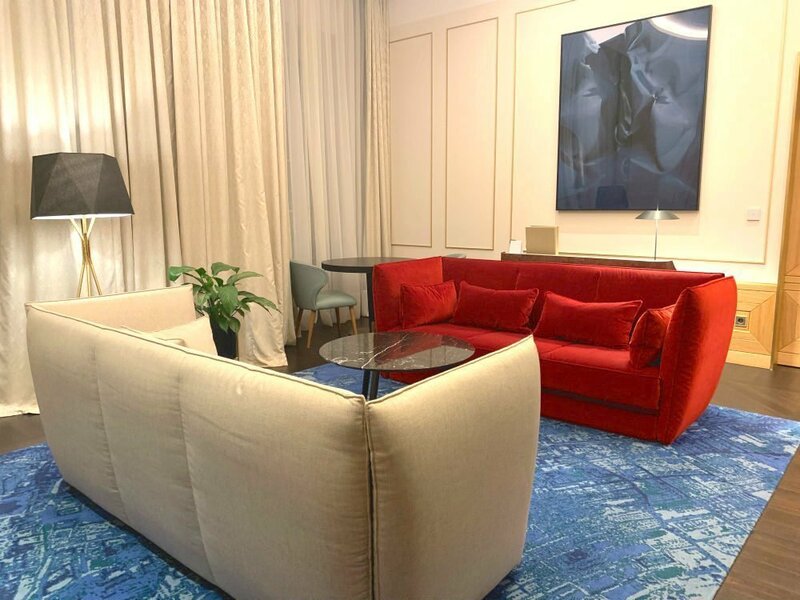 Given its connection to the Raffles name, it’s not surprising to find a ‘long bar’ at Raffles Europejski Warsaw. The Warsaw version is inspired by the original Long Bar in Raffles Singapore and embraces the same sleek design. It seats 50 people, and yes, you can find the iconic Singapore Sling cocktail on the menu. I can’t write a review on Raffles Europejski Warsaw without mentioning its cigar lounge. Stepping into this leather filled room at Humidor is like walking straight into the 1950s. While I wasn’t around during that time (! ), there’s something very charming, in an old school way, about this lounge. Sixteen tan-leather armchairs fill up this quaint meeting place, with colourful pieces of art hanging from its green walls. As the name suggests, it’s a cigar lounge, so don’t expect it to be smoke-free! Along with the cigar menu, there’s also a fine selection of brandies, whiskies and cognac. Everyone’s welcome — except children of course. The lounge is open every day from 12pm to 1am. First-time visitors to Warsaw should know that the main international airport, Warsaw Chopin, is pretty near to the city centre. With a Priority Pass, you can enjoy the privacy of the airport lounge while you wait. The easiest way to get to Raffles Europejski Warsaw is by taxi or Uber. It’s around 12km away, and very reasonable in price too. If coming by train from another destination in Poland, Warsaw Central Train station is 4km away. 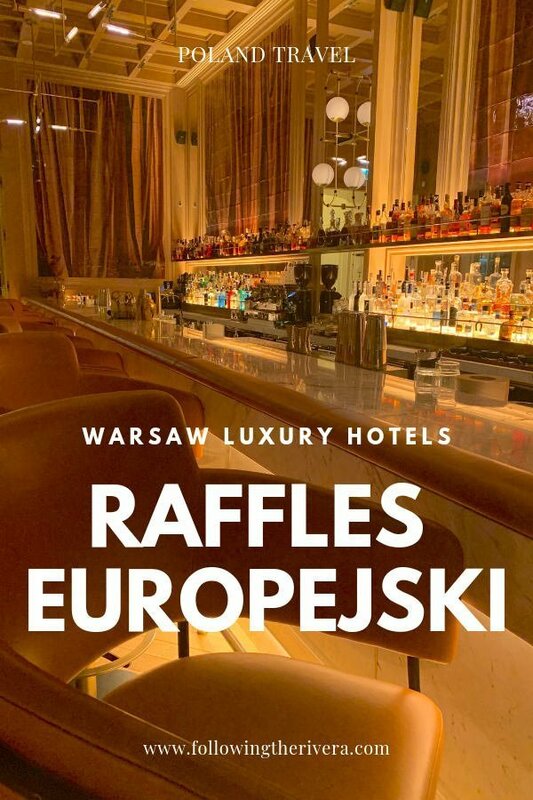 What do you think of Raffles Europejski Warsaw? Is it somewhere you’d like to stay at if you visit the capital? Leave me a comment below as always. This is an absolutely wonderful find. The hotel has such beautiful cozy bedrooms. The spa looks so enticing. The fact that it is so close to the major attractions like the castle is another plus point. What a gorgeous hotel! I’d soak in that tub for an hour, visit that amazing spa, and climb into that cozy bed. You might not ever get me to leave. Looks amazing. The bed is so huge! I kind of wish I could transport it all the way home! I love the Raffles Chain of Hotels. Warsaw is definitely on my list to visit. I can’t wait to have a Singapore Sling in the Long Bar. The bedrooms looked amazing and very comfortable. The decor is beautiful. Such a great place to stay. The Raffles Europejski looks like a perfect place to stay. The best part is the spa. I have stayed at the Raffles in Singapore and can vouch for their hospitality. Looks like a beautiful hotel! Would definitely consider staying here when I visit Warsaw especially since it has such a great location. Holy. Wow. That has to be one of the poshest hotels I’ve ever seen. I love the grandness of the place. The vibe is just amazing. This looks like an amazing hotel. I especially liked the mosaic in the Spa room. The bathrooms also had a gorgeous color scheme. I feel like I would love to visit here during Christmas time, being located next to the Christmas markets seems so perfect. For me, the most important thing is comfort. That bed looks so comfortable! It was amazing, and so huge too! 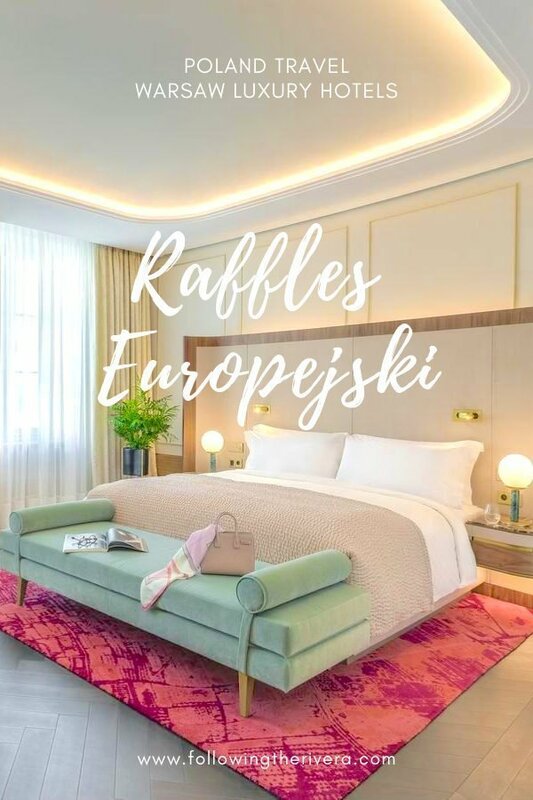 Raffles is definitely one of the best hotel brands out there and the elegance they promote reflects beautifully at Europejski. I like that the hotel is centrally located, ’cause that matter a lot when you are visiting a new city. Loved the rooms and the bathroom with the tub was my favourite. I remember coming to Warsaw on a rainy drub day. If first impressions matter, it wouldn’t be a memorable one. However, if I stayed at Raffles, it could be a different story. Jokes aside, the hotel looks magnificent. Just the grand suite bathroom alone is worth a visit. My only remark would be – seemingly, all hotels around the world regardless of their status tend to lean toward strangely colored carpets. The bedroom is so stylish, but the red concoction on a floor is out of tune. Nevertheless, it wouldn’t deter me from patronizing Raffles of my next visit to Warsaw. Lol I’ve never paid much attention to the carpets, but I’ll look out for it next time! What a stunning luxury hotel! We hope to go to Warsaw soon, and so I will definitely keep this luxury hotel in mind. The decor alone looks stunning, but it sounds like the hospitality is great too. What a beautiful hotel; I am in love with that bathroom! 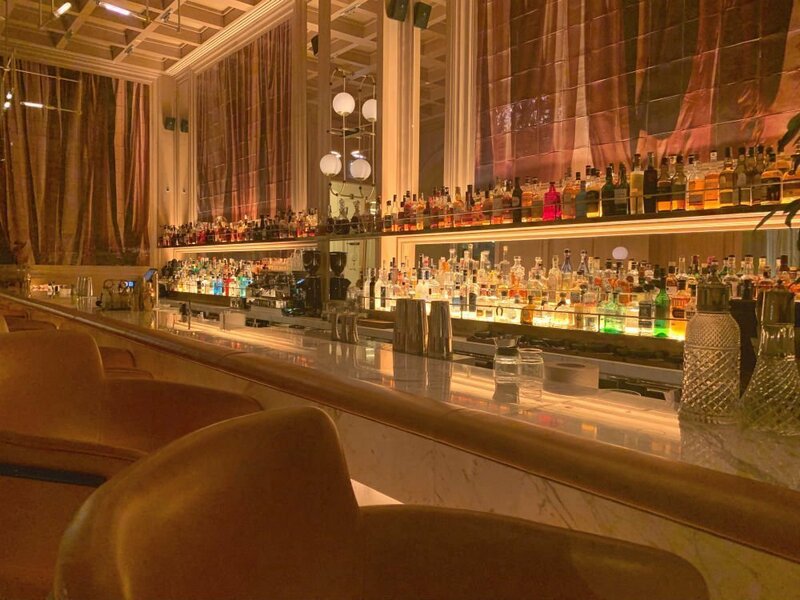 The Warsaw Long Bar looks so romantic; like something out of a movie! The room looks lovely. And the bathtub looks so relaxing. The gelato looks delicious! This hotel is so luxurious! And it’s central location makes it an even more incredible place to stay! It’s the biggest bathroom I’ve seen in a long time! Looks like a perfect place to stay while in Warsaw. Looking forward to visit Warsaw and will stay there for sure! Oh wow, what an awesome Hotel. I would love to stay here once I get a chance to visit Warsaw. 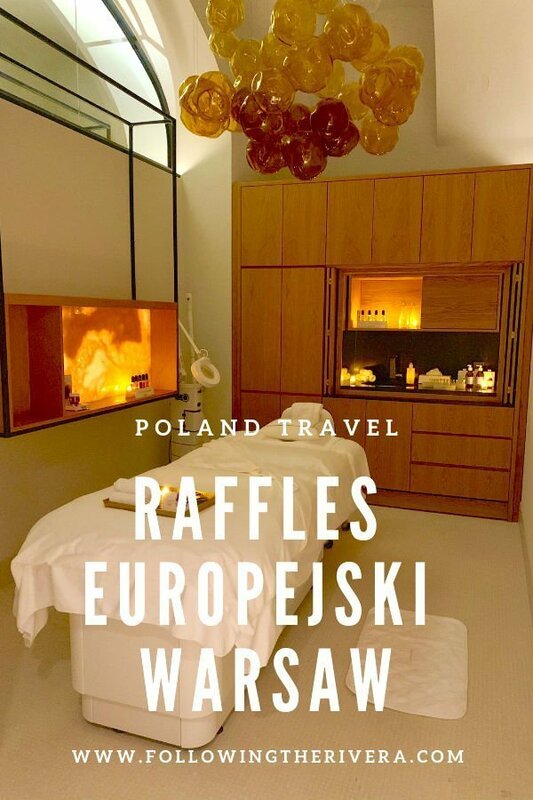 I’ve never stayed in a luxury hotel, but this makes me want to travel to Warsaw just to stay at Raffles Europejski! This hotel looks stunning! The spa services seems tremendous. I don’t know that I’d want to leave the hotel to venture around the city. What a beautiful and luxurious place! I love that tub, I could soak there for hours. I am definitely bookmarking if I am ever in the area. The first picture got my attention. The room looked state-of-the-art and yet so cozy. Everything about the hotel seems luxurious and pampering. It does look into the needs of the travelers. The best part is that it is very close to the castle and other attractions. I must say if I was to visit Warsaw which I am looking to do next year then Raffles would be the place I would want to live in. The location seems perfect and I love the décor. I am a sucker for luxury hotels and this is right up my street. Apart from the accomadation which is top class where I could see myself would be the Humidor cigar lounge without a doubt. Perfect place to end your long day sightseeing. Thanks for sharing a great hotel in Warsaw. You’d really love this hotel! It’s luxurious and that cigar lounge is so cosy, even though I don’t smoke! That looks an exotic resort. I would love to be there. That’s my kind of hotel, simply gorgeous. I love how modern and spacious it looks. Ah, that tub though. This hotel looks like an incredible experience, and rather ritzy. It’s incentive to get myself back to Warsaw, a city I thought was incredibly underrated! Your pictures have totally sold me! It looks like a beautiful getaway and would love to stay there! I’m sure you’d really love it here! 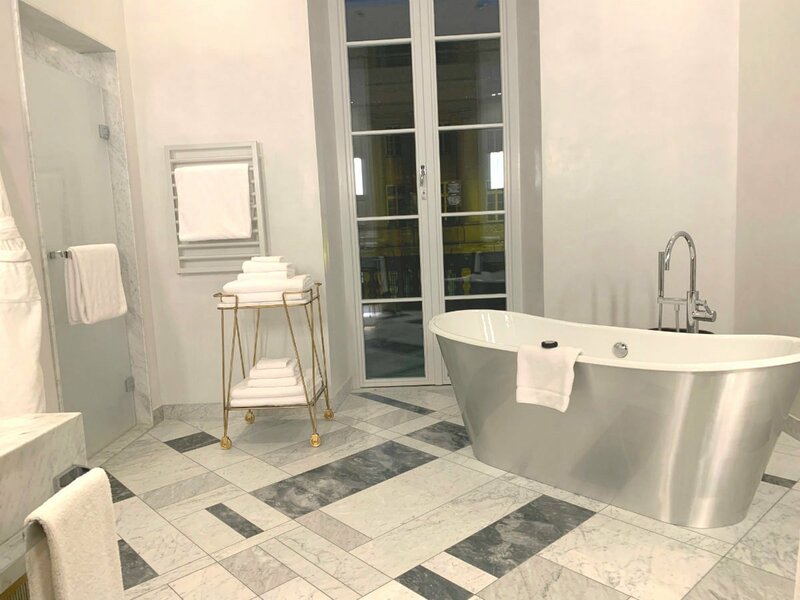 Raffles Warsaw looks so luxurious! I love that the rooms and suites come with libraries. Oh My! This hotel seems to tick all right boxes. Grand and luxurious room, lovely interiors, proximity to some famous places and has a patisserie in the building itself 😀 Would definitely like to stay here when visiting the city! You’ll really love it here, we didn’t want to leave! wow! What a beautiful room and I super love the desk. 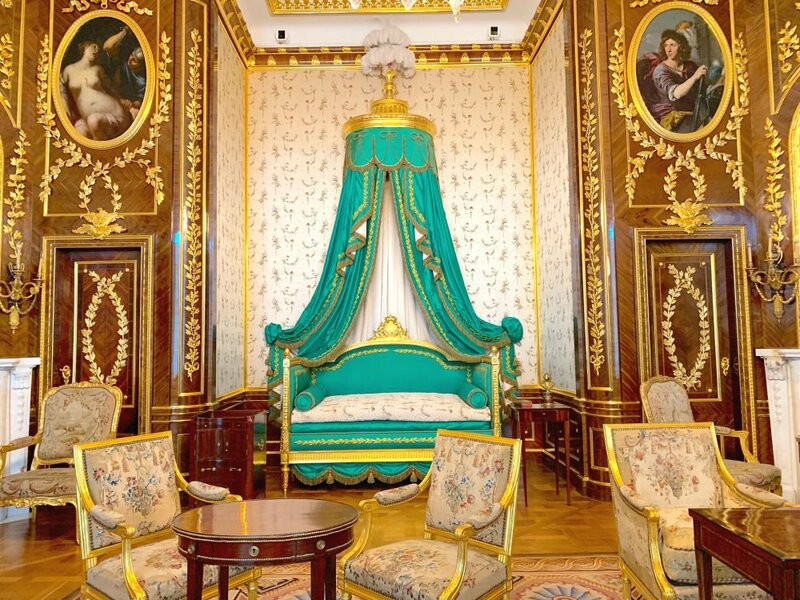 Just got inspiration for the spare room that we’re redecorating. Will definitely keep this place in mind in case we get to visit Warsaw. This looks like a hotel to add to the wish-list. I love the grey tones in the bathroom, it looks so calm and inviting. It’s great that the location is good as well, being in the right spot on a city break is one of the most important factors in choosing a hotel. Good that this one has both style and location going for it. Raffles Europejski in Warsaw looks a royal type of stay with all vintage style interiors. Dining at Lourse looks perfect with Polish inspired blue and white interiors. Also, I would love to pamper myself at Raffles spa with amazing mosaic work in the background. This is STUNNING!!! I would love to go here! It’s a wonderful hotel in Warsaw! I’ve always wanted to visit Poland and Warsaw looks incredibly beautiful. Looks like you stayed at a lovely accommodation too! What was the best attraction in Warsaw as a tourist? It looks so so sooooo luxurious!!! And that bathroom especially, wow <3 I love that it's within walking distance to so many attraction sights too. That's always a major plus. Guess I know where I'm staying if I ever visit Warsaw! Wow! That room really looks amazing. How I wish I could stay there for a night. This is a very informative post about the raffles. Wow it looks like Palace. Very beautiful. I didn’t know about this hotel, but I really like the modern European look, even though it’s located in an building built a long time ago, it still screams that modern look to it. It will probably become one of the luxury hotels of Europe in the near future. Oh, how gorgeous! I have never heard of Raffles before, but it is definitely some place I will have to add to my bucket list! What a lovely place! I’ll be visiting Warsaw in a few months and I’ll definitely keep this place in my mind. Thanks for the recommendation. It’s really a great hotel, consider staying here! The hotel has a very unique character that speaks of elegance. Beautiful photos! Looks so comfortable and especially luxurious. I would love to stay there and want live experience. Thanks for sharing your review so now I will plan my trip accordingly. This is such a beautiful find. Lovely decor, cozy bedrooms, love it! Treat yourself here, it’s wonderful! Wow. Every detail, every corner exudes luxury and extravagance. Yeah, I would totally stay here even only for 1 night. The Raffles hotel is definitely such a posh and exquisitely beautiful hotel, well all the Raffles hotel around the world. Your photos are amazing by the way. Thanks for sharing.